In 1911 Reginald Bainbridge (18) was a horseman on a farm in Marston and boarding with Alfred South. He joined the Lincolnshire Regiment in Nov 1915. After training at Lincoln, Belton Park, Nottingham and Saltfleet he was sent to France in Aug 1916 where he joined 2nd Battalion. That October they were involved in the Battle of Le Transloy, one of the later stages of the 1916 Somme offensive. On 20-22 October there was a great deal of artillery fire from both sides. On 23rd the 2nd Lincolns assembled in Gusty Trench, but the attack was postponed from 9.30am until 2.30pm because of fog. They went ‘over the top’ closely following the creeping artillery barrage. But the first 2 waves came under very heavy machine gun and rifle fire and the Lincolns were shot down almost to a man. 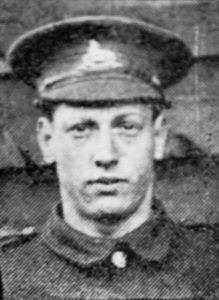 Of the 16 officers and 470 men who’d attacked, 13 officers and 272 men were casualties and Private Reginald Bainbridge was amongst those killed. He has no known grave but is commemorated on the Thiepval Memorial as well as the Honington Roll of Honour. In 1911 John William Bainbridge (known as Bill) was living with his parents on Corby Heath, where he was a farm labourer (age 15). 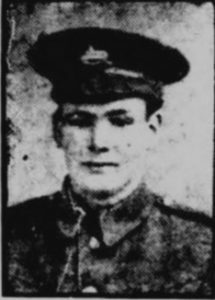 He later spent 3 years with Mr EC Newton of Harrowby Hall before joining 1st Battalion, Lincolnshire Regiment in April 1916. After training at Brockton Camp, Staffs he was sent abroad in July. The 1st Battalion was also involved in the Battle of Le Transloy, in which his brother died. Bill was only 19 when he was killed by a shell on 23rd December 1916. He was buried at Vermelles British Cemetery, between Lens and Bethune. His name is on the Honington Roll of Honour. In Oct 1917 George (the 3rd son) liable for conscription but he was given an exemption. He worked as 2nd horseman for Mr Dowse at Honington Manor Farm.